Whether you’re night hiking, finding your way around camp, or just like the security of an extra light, owning a solid headlamp is key for making sure that you are safe while out on the trail. Without it, you could end up stranded in the dark, and unable to read your map until daylight. Even if you don’t plan to be out at night, it’s a good practice to keep a headlamp with you at all times to ensure your safety, in the event that you can’t get off the hills before the sun goes down. Owning a rechargeable headlamp can make this easier than ever before. So, let’s take a detailed look at the Ultimate Aennon USB Rechargeable LED Headlamp, one of the most popular rechargeable headlamps. Now that you have been briefly introduced to the various features of the Aennon USB Rechargeable LED Headlamp, let’s talk about each feature a bit more deeply so that you can truly understand the pros and cons of this headlamp. This specific headlamp is known for its brightness. At full charge, its LED light can produce up to 220 lumens of brightness. If you’re not familiar with what this translates to, it’s very bright! You can light up to approximately 500 feet in front of you while using the headlamp on full settings, but that will run your battery out relatively quickly. Each of these lighting modes can be used in different scenarios. Red lights are often beneficial for night-vision-type usage, while strobe lights can be used to help in emergency situations or to indicate your position to fellow hikers who are trying to use you as a guide to help find their way. The LED light mount on this model is adjustable, and it’s easy to tilt it into different positions to ensure that you are lighting up the area you want to see. This model provides up to 60 degrees rotation, so it’s easy to light up exactly what you are looking for or where you are heading to. For example, say you need to pivot it downward to read you map, and then back upward to see the trail ahead. This headlamp is also very easy to control. From easily adjusting the angle to easily switching between the different light modes with a single button press, using this headlamp isn’t complicated, and it shouldn’t be! You can focus on what you are trying to see rather than focusing on fighting with the headlamp. Now, let’s talk about the rechargeable aspect of this headlamp. The lamp is rechargeable via a USB cable. This makes it very easy to charge before heading out. The battery is designed to last up to 30 hours, so you can make it through a few nights without needing to recharge. However, while it’s convenient to be able to charge your headlamp via a USB cable and you might have a battery pack with you, it’s not possible to just replace the batteries when they run out. This can be a problem for hikers who are planning on using this frequently without having a chance to recharge. Another problem is the battery life. While it’s great to be able to produce 220 lumens with this headlamp, the battery will die much more rapidly than 30 hours if you use the headlamp at 220 lumens all the time. A more realistic battery life, in that case, would be somewhere around 10 hours. While still commendable, this is worth noting. While this model is rated with waterproofing of IPX4, it is not completely waterproof. Water splashes or sprinkles won’t hurt the headlamp, but being doused in rain for hours could cause it to stop working if you don’t take care to dry it off from time to time. If you want something that can shine even brighter and last even longer, your best option for a great headlamp would be the GRDE Zoomable LED Headlamp. This lamp features LED lights that have a combined brightness of up to 1800 lumens, nearly seven times as much as the Aennon rechargeable model. Additionally, the high-power rechargeable batteries can hold their charge for many hours, depending on the settings that you use it with. Basically, this model will hold its power well. Of course, you have to pay for that power when investing in the GRDE model, but serious hikers who want to have a reliable product that will not wear out on them during multi-day stretches will surely be happy with the power and precision of this high-powered headlamp. Just do take note that as compared to the Aennon model, this product only comes with three light modes. Also, its strap might be too short for some users. 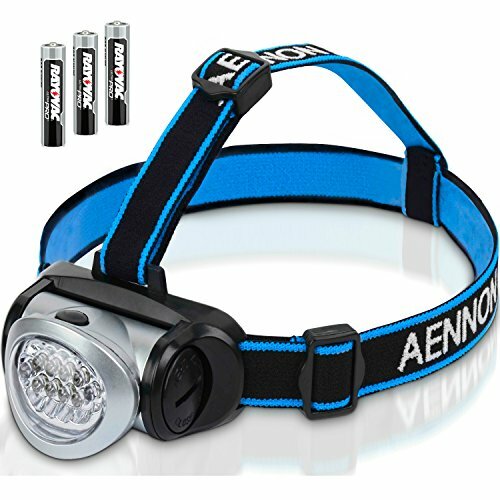 The Aennon USB Rechargeable LED Headlamp is a great option among various rechargeable headlamps on the market. In addition to having a reasonable number of lumens and adjustable light, you can also select between different lighting types to help make your journey easier. If you plan to do single-day or short multi-day trips, this is a great option. The battery will last long enough to make the entire trip easier, and the simplicity of the added features will help ensure that your time spent on the trail or at camp is spent enjoying the use of your headlamp, not struggling to make it work properly. Overall, this is a super bright, powerful headlamp that can be easily recharged using a USB cable and is a very versatile tool to use while hiking or moving around camp. We hope you found this deep dive look into the Aennon USB Rechargeable LED Headlamp useful and informative. There are a wide range of headlamps to choose from on the market, with all sorts of options ranging from the basic to the more complex. Before you choose what to go with, be sure to be clear on what your needs are, for example, do you just need a bit of light for a light trail night hike while walking your dog, or do you need to have decent visibility on a deep and dark mountainside miles from civilization.